Really. It never ever fails. The Legal Genealogist does a hit-and-run on something like a term of the day, and somebody offers a reminder that… well… it ain’t necessarily so. Or to quote my favorite phrase, sometimes, it depends. Yesterday, the blog highlighted the term younger children — an English legal term of art that doesn’t mean what we think.1 The rule it featured was the rule that the oldest son would inherit the land, and all of his siblings were “younger children” — even if they were older. In 2012, I was given a gift of a CD. The CD — available here — is of a book by John Gifford, Esq. 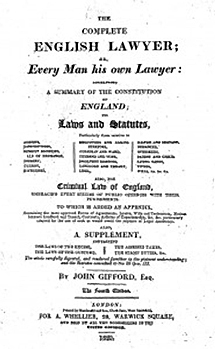 The short title is The Complete English Lawyer; Or, Every Man his own Lawyer : Containing a Summary of the Constitution of England; Its Laws and Statutes.3 It’s the fourth edition, published in 1820. And the simple fact is, some of what you can learn from it is just too much fun. Let me give you just one example. In the introduction, Gifford notes that “part of the unwritten, or common law of England, are particular customs, or laws which affect only the inhabitants of particular districts.”4 And for this he cites two examples that, quite frankly, took me a bit by surprise. One was the custom of gavelkind and the other the custom of borough-english. The rule of primogeniture crossed the Atlantic with English common law, and that’s why you’ll see some early wills in colonial America that don’t mention land and don’t mention an oldest son: unless the will specifically said otherwise, land went to the oldest son, period. And that’s the whole thing behind that younger children term in yesterday’s blog. This discussion reminds me of the German Salic Law of Succession, Lex Salica, established by King Chlodwig (Clovis) of the Francs. Then there is the Guelphian (Welf) Law of the House of Hanover (which is the line of British monarchs). Judy, could you do a blog about this? Ah, yes. Regional difference in invasion / settlement patterns came cultural differences. An enduringly useful reference is Fischer, David Hackett (1935-), Albion’s seed : four British folkways in America. It includes some information about differences in inheritance customs in East Anglia, where land inheritance by the youngest son was common. Sorry my cut-and-paste did not work well. The book’s publication date was 1989.